A few notes below for anyone installing VMware SRM 5.1 with a CLARiiON CX3 and CX4 SAN. The following scenario below has a CX3-10c in the ‘Protected Site’ and a CX4-120 in the ‘Recovery Site’. The VMware Compatibility Guide reveals that the CLARiiON CX3-10c is only supported up to the ESX 4.1 U3 release. 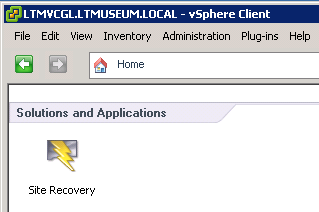 Here we have ESXi 5.0.0 installed and it works without problem – it is a typical case of “just because it isn’t supported doesn’t mean it won’t work” (really, it boils down to VMware not having the time or resources to test every storage model, with the older models receiving a low priority in the order of testing.) The CLARiiON CX4-120 is supported to the latest ESXi version 5.1. The VMware Product Interoperability Matrixes also reveals that all ESX(i) version from 4.0 are supported with SRM 5.1! Here – with the CLARiiON CX arrays – Mirrorview/A replication has been pre-configured and the datastores have been replicated across the wire. The Mirrorview configuration is essentially a case of creating a reserved LUN pool (RLP), creating secondary images of primary volumes, and configuring replication schedule, but in more depth than this one sentence; and this is a substantial topic in its own right and is out-of-scope of this article which has a baseline of already working replication. All the softwares can be downloaded from either VMware’s website (1, 3, and 4 below) or EMC’s Powerlink website (2, 3, and 4 below). Note: The step-by-step walkthrough installation guide below is written for installing SRM components onto an existing vCenter. It is recommended in environments of 100+ VMs / 10+ hosts to have an SRM server that is separate to the vCenter server. 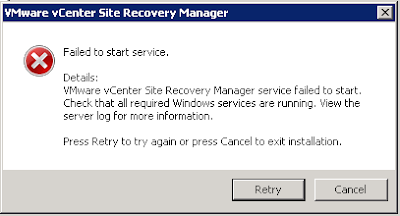 Note: If you encounter an error at the end of the SRM installation ‘Failed to start service’ and clicking on cancel would roll back the installation, then change the VMware vCenter Site Recovery Manager Service to Log On as the account with DBO permissions to the SRM database, click retry and the installation will complete.